In frustrated haste, a seemingly ordinary woman stuffs the items littering her floor into a cardboard box. Then, with a screeching roll of packing tape, she seals it. She might be any exasperated woman packing to move house under less than pleasant circumstances. 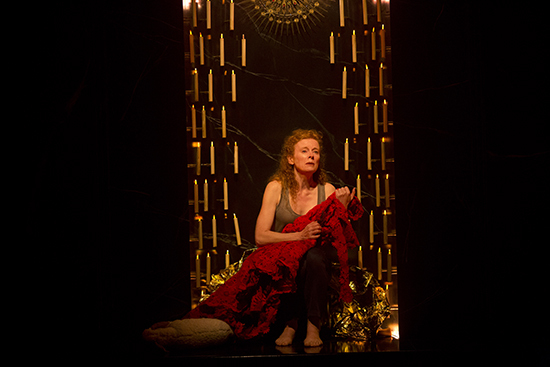 But she is none other than Mary, mother of God in the Sydney Theatre Company’s adaption of Colm Tóibín’s novel The Testament of Mary. Told by Mary (Alison Whyte) from her recollection of events, this performance covers the adolescence of Mary’s son (whose name is never spoken), his raising of Lazarus from the dead, his crucifixion and its aftermath. The bulk of Tóibín’s 81 pages are delivered, less as formal monologue than as a series of vignettes accelerating into narrative. In this sense, the work takes not only content but also structure from Tóibín’s text, which, chapter-less, unfolds in jagged episodes punctuated by emptiness. Onstage, this discontinuity is marked by blackouts and the strains of a repeated hymn jolting to a start only to be cut off by the ensuing scene. Later in the performance, nearer to Mary’s experience of the crucifixion, this sound effect changes to a cacophony of curious gurgling and arguing, the echo of a drunken mob. 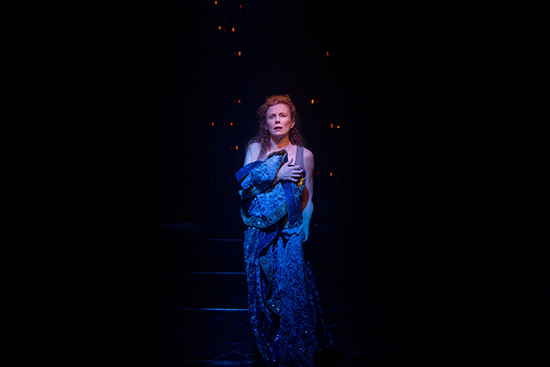 Max Lyandvert’s sound design also creeps into the background of some of Mary’s more impassioned speeches, particularly when she quotes his words or recounts her son’s supposedly miraculous doings. I say “supposedly” because this Mary is skeptical. With keenness and authority she presents her perspective, challenging versions of her life recounted by male prophets. Whyte’s vocal delivery of the text eases between a series of registers: casual to the audience, private to herself and mightily declamatory. At times she sermonises. Then she rails desperately as though she alone were aware of one of the largest conspiracies in existence. A few stumblings over lines only enriched the humanity of Whyte’s Mary in a piece that was as much an encounter with the performer as with her character. Elizabeth Gadsby’s shrine-like set of black marble, veined with white, becomes plinth, platform and pulpit for Mary. The audience is roped off from the space by a border of red velvet cords and gold dividers, as in a museum. Sometimes Mary approaches this boundary, clearly seeking freedom among the audience. At others she hangs back in the centre of the space, separating herself off as a woman who could never be entirely ordinary. At her most conversational she sits down on the set’s three rows of steps leading up to its rear wall, like a neighbour chatting on her doorstep. At one time she sits wrapped in a space blanket, the image of a traumatised survivor huddled on the footpath. Bold lighting from Emma Valente tightly focuses each episode. A swathe of deep blue falls over the set as Mary describes an uneasy encounter with her grown son. Arid yellow light beating down on her adds an edge to the narration of the crucifixion. A jewel-red tone as Mary sits cradling a bundled dress like a baby gives her the aura of goddess, a super-human exemplar of the maternal. While Mary narrates the reanimation of Lazarus, a shadow covers the centre of her body, allowing her to inhabit the wizened corpse of a man slipping back from death. One transition brings the house lights up to full, implicating the gaze of the spectator in Mary’s struggle to achieve her own truth. 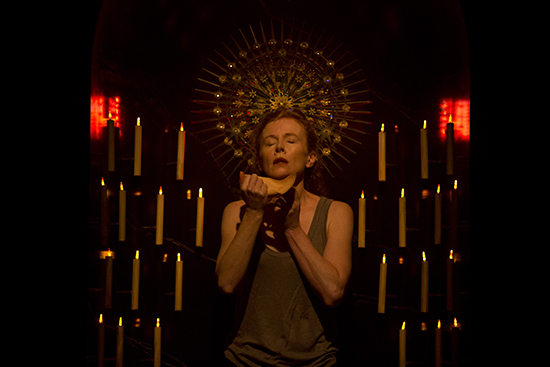 Director Imara Savage and Alison Whyte have wrought a complex, physical Mary. Whyte’s hands and fingers are especially active: both bending in pain and folding into a holy gesture, two fingers raised, recognisable from religious artwork. Touching her thumb to her index finger, she seems to pinch divine energy between them as she evokes the sensations of her experience. Once, in threat, she crouches, a knife in her fist. This Mary means business. [SPOILER ALERT] The production begins by depicting Mary as she often appears in contemporary iconography, as figurine or lawn statue. In a candlelit archway Whyte, dressed in heavy red and wrapped in a glittering blue mantle, stands bearing a stuffed toy lamb while a hymn intones around her. A plastic, light-up sacred heart is visible on her chest and a similarly twinkling halo hangs behind her head. Suddenly her two hands fall with a clunk to the ground; they’re fakes. The lamb is tossed aside, the heart too. Off comes the dress, the mantle and, surprisingly, a full-face mask, demure and rosy-cheeked. Last off is the red wig, revealing Whyte’s real red hair. Mary stands before us now in a relaxed, contemporary outfit of linen, her body limber and itching for activity. Unencumbered and alert she commences a version of the Bible stories that puts to shame milky images of religion as seen in celluloid paraphernalia or picture books. It is her glitzy goddess get-up that Mary dispatches into that cardboard box, packing it away for good. Given the chance to speak she can never return to her statuesque silence. Not ever.